9000 miles from home | Apple pie, anyone? January of 2015 stole my words and broke my heart. For three months, our little family drew in tight together and stripped life down to the essentials: be together, be kind, be safe. No more, no less. I am not free yet. In late April, Curt and I found ourselves hours away from a trip across the ocean that had been planned for 2 years… South Africa. It was a massively orchestrated ordeal involving 8 plane tickets, 5 caregivers, color-coded schedules, power of attorneys, and 2 weeks of vacation. My suitcase was still empty with 6 hours until boarding. Campbell said, “Go. You can stay here and hurt or you can go and hurt. Go.” I packed half-heartedly for a trip I did not want to take. But the plane continued south over the equator and I wrestled with God above the clouds. The sun was inches from the horizon as I climbed into the back of a truck with 8 other guests. Our guide began to ramble down the road, and I saw the land shake off its sleep. Shadows became green leaves and brown bark. I saw a zebra and her calf scoot across the main road. I sat for 30 minutes and watched a cheetah look for a place to sleep. Familiar and brand new and chaotic and easy. Why would God bring me to the other side of the world at the most difficult time in our family’s life? To show me how far He would go to bring me back home. To let me laugh again. To give me space. To have me see impossible animals in unbelievable proximity. To stand in awe. To prove, in ways I could completely understand, that He never changes. We are never prepared for what we expect. [I feel like I’m teaching myself to tell stories again. This entry was posted on Wednesday, May 6th, 2015 at 2:11 pm	and tagged with muldertenyear, South Africa and posted in writing. You can follow any responses to this entry through the RSS 2.0 feed. True. True. 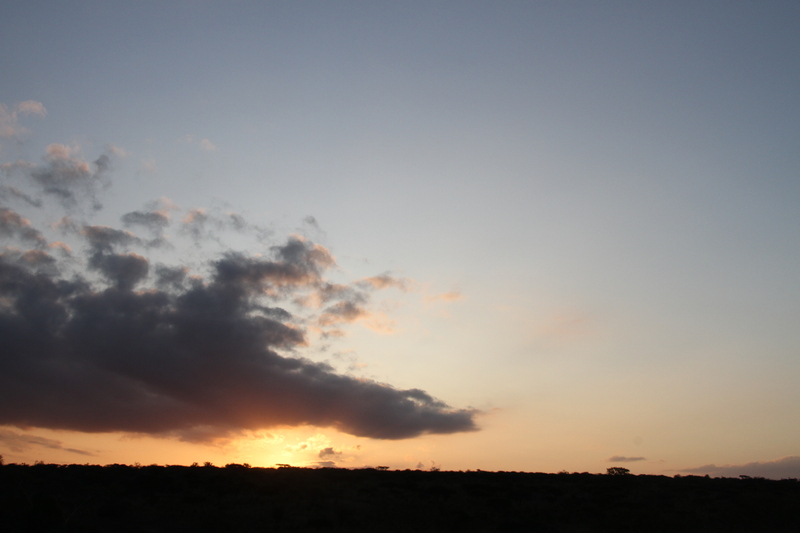 There is something about Africa…(insert a big sigh here). I have visited a lot of places in my life. Some are curious, others are entertaining, still others invigorate and rejuvenate in different ways. But there is something about Africa (sigh) that changed me from the inside out, from the upside down. Once one visits Africa, life in America should never be quite the same. It never has been the same for me. So good to hear your voice! God is so very faithful and so very surprising and so very amazing and caring and and and. . . . God’s whisper to you and His encouragement to me through His whisper to you. I love it that He works like that. I’m so thankful that you are where you are. My mantra lately “Always be suspicious that God is up to something good.” Most days that requires more suspicion than I care to muster and, although my heart KNOWS it’s true, it’s taking my head a while to come around. So happy for this “journey”–for your body AND your heart. This is so good to read. I’m stuck in an endless winter myself at the moment…this is a ray of sunshine. Thank you. I knew it. I knew from out of your deep pain would come beautiful stories of who God is. Oh Kate, how I love to hear your heart through your words! God is good! I needed your words today. Wow. I have really missed this…missed you. I know we’ve never even met in person, but I want you to know that the stories of your life make mine better. Your beautiful faith and honesty and view of the world touch my heart, make me think, help me grow, and very often bring healing to my broken heart. Thank you for your honesty and your courage and for reminding me to look up out of the crazy mess of life. And thank you for sharing your children. The stories you tell of them bring much-needed smiles and laughter to my life. You are a treasure, Katie Mulder. A beautiful star that shines brightly in the midst of our broken world. I pray that this journey you are on will bring healing and rest to your precious soul. Oh, how I’ve missed your cyber-presence and your beautiful words! I’m so glad you had the opportunity to get away like that, and to find laughter and peace in an unexpected place. I love you, Friend, and I’m sorry it didn’t work out for me to hug your neck in The Netherlands! I miss your voice–haven’t heard from you in months. I hope all is going well. Beautifully written as always. So nice to read your words again. Love you friend. I just sat here and read through the last couple of years of your blog. I hope one day your kids know and appreciate the kind of great mom they have. And, gosh, I’m crying on this one. I see I need to read even when I’m not writing. Achingly good ~ and somehow, in the chaos of life, I hadn’t realized you’d gone to SOUTH AFRICA. I can’t wait to read more.